The service industry is being transformed by radical advancements in technology, including the deployment of sensor equipped products whose data feedback opens doors to service models based on IoT integration, machine learning, and AI. However, aside from the forces of technology, there are other questions hanging over service managers that will become just as important to answer when defining the near-future of the organization. As the Millennial generation, with their cultural ideas of what a positive workplace looks like, desire for a strong work-life balance, and hunger to experience the cutting-edge becomes the largest generation within the workforce, changes in strategy to retain these workers should be expected. On top of that macro trend, the service industry is experiencing a loss of many technicians who are naturally beginning to age out of the workforce whose knowledge can be difficult to replace. 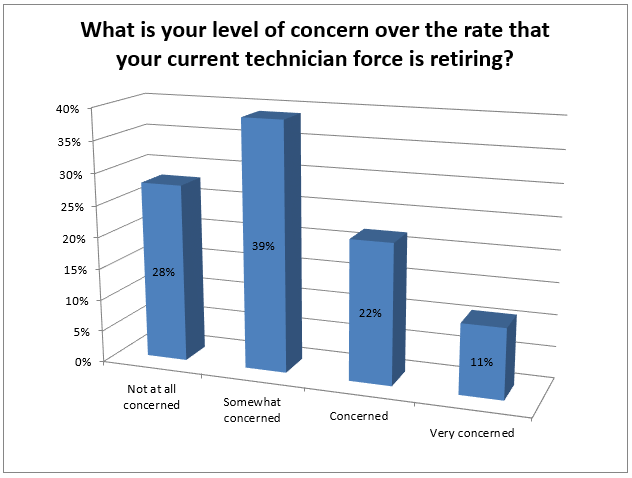 We can see that 72% of respondents feel at least some level of concern over the fact that their technician force is being thinned out by retirement. A full third of respondents admit that their levels of concern are beginning to become acute. 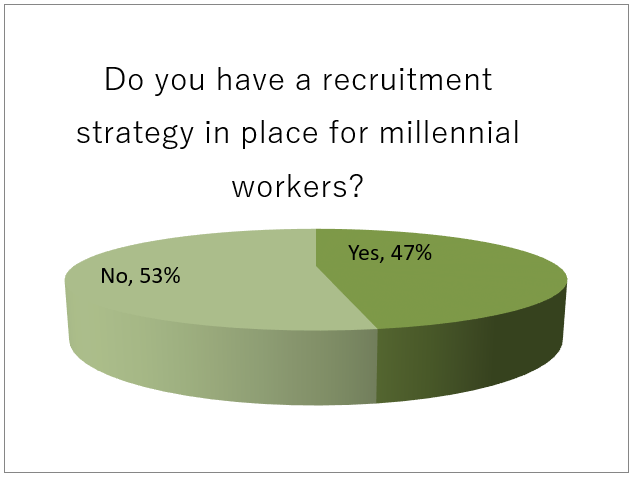 Despite the concern within the market relative to oncoming technician retirements, the majority of respondents still do not have specific millennial recruitment strategies in place. This may be due to the fact that within certain environments where highly experienced technicians are a requirement, targeting criteria does not yet overlap with a primarily millennial demographic. That said, this will not remain the status quo for much longer, and the development of strategies that are geared at millennial preferences today may well be required as a means to appeal to the broad preferences of a transformed workforce in the near future. Within the context of a talent market where many valuable senior employees are nearing the end of their expected tenure, it's incredibly important to develop the means to rapidly improve the skills of new hires in ways that will keep them engaged and build satisfaction with their roles. One method for doing this is the concept of gamification, which holds natural synergy with the increasingly common deployment of mobile devices to assist technicians in the field. While gamification will not typically replace the years of on-site experience that a seasoned technician brings to the table, it can greatly assist in breeding familiarity with processes as well as the development of mechanical skills with the key benefit of being engaging as well. Predictably, this technology is viewed as an asset when courting millennial hires, as their desire for tech exposure and engaging workplaces dovetail perfectly with this form of training. 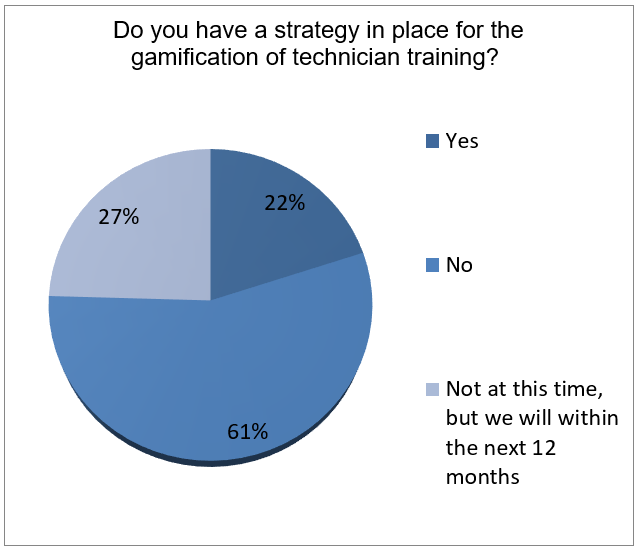 While 61% of respondents do not offer gamified training tools at this time, within the next 12 months 39% of respondents will have made this a part of their training strategies, pointing a a robust shift in a relatively small amount of time. You'll discover other strategies that your peers are using to manage their talent pipelines when our full research report is released. Until that time, you can view a ton of fresh content in our content center! Interested in research sponsorship? WBR Insights will create your customized activation and boost your sales pipeline. Contact us at 646-200-7546 or email us here to learn more.